Another Irvan racing up through the ranks! 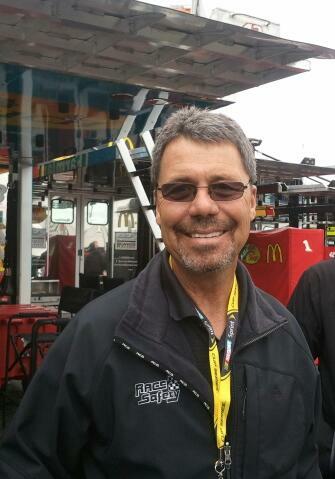 It did my heart good to run into my old friend and classic NASCAR racer Ernie Irvan (15 cup career victories) at Richmond International Raceway this past weekend. It was fun to just see Ernie again and to hang out in the garage and catch up on the Irvan family and interview him before the race for SiriusXM NASCAR Radio. It’s so hard to believe that Ernie and wife Kim’s daughter Jordan and son Jared are so grown up now and making their own mark on the world. With the support of Ernie and Kim -Jordan and Jared are flourishing. Jordan is an 18-year old high school senior who has been riding and showing Paso Fino horses and winning awards since she was 4 years old. Jared is 14 years old and these days is behind the wheel racing. With his father’s skill, experience and tutoring, Jared is working hard to try to make his way into the NASCAR ranks one day. Ernie beamed with pride as he took his phone out in the RIR garage on Saturday and showed me photos of his family! So what about this young Jared Irvan? Chip off the old block? Ernie said he doesn’t really know how it’s going to go but added, “I always expect it is going to be good and that is going to be the problem. Everything we do keeps costing more money but I want to help him all I can.” Irvan told me that he told his wife it doesn’t matter if they use up everything they have, if they can be there to support their kids’ talents then that is what they will do. Ask a fan about Ernie Irvan and the most common answer I get is, “He was the man!” So is Jared Irvan like the storied Ernie Irvan, who gained a reputation as a hard-core up-on-the-wheel racer? The Irvan family moved back to the Charlotte Area fromCharleston,SCrecently for a number of reasons and they are intact and thriving. It’s hard to not to breathe a “Thank God” every time I see Ernie after remembering the horrific crash Ernie suffered at Michigan Speedway in 1994 while driving for Robert Rates Racing. He made a miraculous recovery and returned to racing at the end of the 1995 season with two top-10 performances. He returned to victory lane in 1996 with wins at New HampshireandRichmond. You can follow the family on the newly created Irvan family website www.irvan.com. Through the web site you can even send in photos and have them autographed and returned to you. By the way, I asked Ernie Saturday who his pick was to win the Capital City 400 Presented by Virginia is for Lovers Sprint Cup Race Saturday night atRichmond.